At our guild’s quilt show in April I bought a Batik Gemstones package called Blooming Bugs. I used the Popsicle Sticks pattern and made a small lap quilt, 48” x64” using the whole package of 40 – 2 1/2” strips. I liked the soft colors of these batiks and was tempted to pull out the dark teal but then changed my mind and left it on to add a pop of color! I’m glad I left it in. I found a 4m cut of batik in my stash that worked for a backing and was happy that it behaved well and had good thread tension on the back. The pantograph that I used is called “Deja Vu” from Urban Elementz and this is my first time quilting it. I really enjoyed quilting it out and love how it looks. It’s had a nice balance of feathers and swirls, my two favourite designs! I used a soft blue So Fine thread on top, a pink Bottom Line on the back and Quilters Dream Cotton Deluxe batting. Well I ended up making seven baby quilts using the Stitch and Flip method on my longarm. The scrap quilters out there will be very happy to hear I used up every scrap that Eileen gave me! This is a great start for a worthwhile charity, I know I’ll be making more once I get more fabric! I also finished another Good Tiding quilt for our guilds this week and quilted it the same as the first one. This one will be raffled at our guilds xmas party so one lucky member or guest will win this one! For the past couple of years our guild has donated baby quilts to a local organization that puts together gift baskets that are give to the less fortunate at Christmas time. They really appreciate the baby quilts as they are always in need of gifts for babies. This year we talked about making Flip and Stitch quilts and I thought that would be very fast to whip up on my longarm. I load the backing and batting on my machine and then start by layering two strips of fabric right sides together on the batting and then sewing across the bottom using my channel locks. I flip back the top fabric, add another fabric then repeat. Stitch and flip! In half an hour I had a baby quilt pieced and quilted all in one step, they just need the binding. I ended up making 3 yesterday! Now since I don’t have a stash of flannel I raided my friend Eileens stash and we found enough strips in her scraps to make 6 baby quilts. The strips ranged in size from 2” to 4”, we arranged them by color and I just randomly added then on. She was very happy to see this strips go to good use and has motivated her to keep digging into her stash. 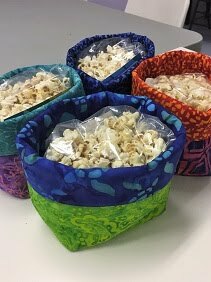 I am happy that I get to use up a lot of my batting scraps! I had a large piece of white flannel that I cut in half and dyed one pink and one blue for backing, so have enough to back 4 baby quilts. My friend Phyl donated some really nice green and blue gingham flannelette that will back 4 more baby quilts and that I used on the green and blue quilt. I had a bit of a panic when I was dyeing my backing pink as I thought I had created a dark ‘bubble gum’ pink when it was in the dye bucket, but once it was dried it turned out fine. I plan on making three more today and have ordered some sale kids prints online to make some with cotton fabrics on top later this month. I’ll be cutting those 6” wide to make the process even faster! I know there are a few other guild members making these as well and they are finding them addictive to make too! I’ve had this quilt in my Shack patiently waiting for me to quilt it since June. It belongs to my client Valerie and I had loaded it on my longarm and started quilting in June but quickly discovered a problem. The batting bearded terribly though the backing fabric! This rarely happens with Quilters Dream Blend batting so I suspected it as a backing issue. The backing was a good quality Kansas Trouble brand wide backing but it had the strangest feel to it. The fabric was very thin with a tight weave and felt like it had a slippery coating on it, Lori thought there was a lot of sizing used on it to make it feel that way. It was acting like a batik, and even though I love piecing with batiks I don’t like using them for backing because the needle just punches holes in the backing instead of separating the fibres in the fabric. Here is what the original backing looked like. So I picked the row of stitching out, fortunately I had only quilted one row of a panto and then noticed the problem. I called Valerie and explained the problem, she was very understanding and was in no rush for the quilt. I picked up a new backing for her when I was on my trip in the States and had no problem with bearding with this new backing. Yeah, problem solved and it turned out beautiful. I just wanted to share this story for those that encounter the same issue, it is usually the backing fabric that is the problem. Sometimes a dull needle or bad batting is to blame but for the most part the backing has a large part to do with it. I also thought of switching to a black batting as the backing was navy but then that would have looked terrible on the front as the needle holes would have been quite dark. If the top was navy then a black batting might have worked. 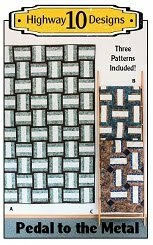 When buying backing for a quilt try to think of what color of thread would look best on the top and try to buy a backing in that color. 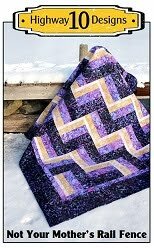 This eliminates a lot of issues and gives the back of the quilt a whole cloth look. 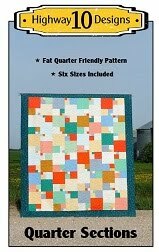 I really like the look of a quilt when you can match thread color that compliments both top and backing. This can’t always be done but it is something to think about when buying backings. Here is a close up for the backing I found and how it turned out. No bearding because the backing had a slightly looser weave so no holes for the batting to poke out thought. I actually used a medium grey thread but it looks blue on the backing. Now lets get to the pictures of Valerie's Turning Twenty batik quilt. 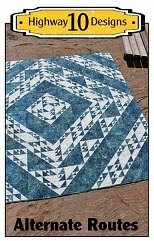 Love all the blues and greens she used, it makes for a very calm looking quilt. I chose the panto Taro for the quilting design and So Fine blue thread on top and Bottom Line grey for the backing. Things are starting to cool down here, summer is coming to an ending and I’ll be starting back to work next week. I have one more quilt to finish for the guild, the second Good Tiding quilt, and then I’ll be back to blogging regularly again. Finally some quilting to share with you! I haven’t touched my longarm in over a month so it felt weird to load up a quilt and try to be creative again! I struggled with what to do in the center of the wreaths so did all the other quilting first. I started with the SID, then the swirls in the background and the loops in the green and red wreaths. Once that was all done I sat and stared at the four blank centers of the wreaths…this quilt wasn’t talking or whispering to me at all! I think my problem was I originally said to myself ‘don’t do feathers on this quilt’ but I didn’t like any of the drawing I came up with until I drew this. I liked the varying sizes of the feathers instead of an even feather wreath. The quilt pattern is called Good Tidings by It’s Sew Emma. The fabric collection is called Solstice by Kate Spain and Kona Snow for the background. This is actually a guild quilt but I suggested that this be our next Christmas Raffle quilt and everyone agreed! So I got to shop and the guild paid the bill, good deal! We pieced this top at our July meeting and we cut enough to make a second one. This is a great fundraiser for our group as we have a one day raffle at a local craft sale in November and raise about $500. The ‘drawn today’ aspect of this idea is what sells a lot of tickets. Finished the second Minkie appliqué pillow top, this one is called The Crafty Beaver by Robinson Pattern Company. I only bought the two kits so regret not buying the third one! This morning Tim and I went out see if the wild blueberries were ripe and we were happy to see they were ready for picking. Mine is the bigger bucket, I had years of ‘mandatory training’ when it comes to picking blueberries when I was child! :) Hope to get out to pick a few more times this week so I can fill my freezer. I picked up a couple of cute pillow kits when I was in Winkler, MB at a great quilt shop called Road 17 N. This pattern is called Midnight Wolf by the Robinson Pattern Company. They have a website here and you can see the Beaver and Fox pillow patterns as well. I had time to appliqué the Wolf one this morning and it is made with Minkie. I have never appliquéd with Minkie before but it went well and I just used a small zig zag stitch and used a batik for the background. I do plan on quilting it and making a pillow but I do not have any pillow forms on hand. While on our trip we came across a beautiful building in Menomonie, Wisconsin called the Mabel Tainter Theatre, built in 1889. The ornate designs on the outside of the building were amazing and I had to stop to take pictures. 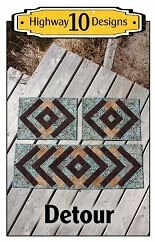 I found the designs very inspirational and think they could be adapted to quilting designs. I’m sure many of you find inspiration in architecture designs so I thought I would share these pictures. We were told the inside of the building is even more spectacular but it was not open when were driving though the town. Over the last two weeks we drove 5400 km, covered nine States and one Province! Our destination was Indianapolis, Indiana for 3 days of car racing! It took us five days of driving to get there with Winnipeg being our first night. We reached Sioux Falls, SD our second night and drove around town to find the falls, not disappointing at all! We headed to Omaha, Nebraska the next day and I found a fantastic quilt shop called The Country Sampler, a must stop for any quilter! After the quilt shop we stopped at Lauritzen Gardens to see the trains on display and pick up a geocache. My GPS died just as we got to the site so we had to use our geo-senses and memory of the description to find that micro cache and we found it! We stopped in Des Moines, Iowa for our third night. The next day we made it to Indianapolis and found our hotel which our was home for the next five days. There were activities and races at the Indianapolis Motor Speedway for the next four days. My boys and husband really enjoy racing and I don’t mind going to the races, I know more about NASCAR than I care to admit! On the Friday my son meet up with one of his online friends at the track and they chose to watch the Tudor Series and Continental Tire Series from the infield viewing mounds. Since it was hot and sunny the rest of us chose to sit up in the stands in the shade. During the second race I get a text from my son saying “ I just had my picture taken with Jeff Gordon”. OMG! Jeff is my sons favourite driver and as we were planning this trip I keep thinking in the back of my mind wouldn’t it be amazing if he actually got the opportunity to meet his idol. Here’s the picture. Andrew said they were just watching the race when Jeff walked over with a friend and they stayed and watched the race for an hour on the same viewing mound that Andrew and his friend were standing on. When a few kids approached Jeff for autographs he signed them and that is when Andrew and his friend asked if they could have their photos taken with him. He was a very friendly and happy to talk to them, a real class act! Everyone in this viewing area basically left Jeff alone to enjoy the race. If this was a NASCAR race day I’m sure he would have not been able to do that. This was a dream come true for my son! Some drivers were lucky like Carl Edwards who crossed the walkway when it was almost empty. Here are some happy guys after watching Jeff Gordon win the Brickyard 400! That was the icing on the cake for this trip, watching my sons favourite driver win after meeting him! It is great to be back home and my sister is visiting for the week so I only have plans to swim, kayak and relax as it is going to be warm and sunny! I need to enjoy this warm weather as it won’t last long. I hope to start a few quilting projects soon to share with you! Hope your all having a wonderful summer.